Kendall Graveman was two outs away from something he has never done in his baseball career. Not during 10 starts last season for Class A Lansing or during his decorated four-year career at Mississippi State. Not in high school or even Little League. The Blue Jays prospect was two outs away from his first career no-hitter Friday night before Beloit's Jose Chavez reached on an infield single. "You get so close and you almost taste it and you want to have it, but sometimes it doesn't happen and then you have to move on," Graveman said. The 22-year-old right-hander was relieved by Griffin Murphy, who allowed a single by Chih Fang Pan but got A's No. 12 prospect B.J. Boyd to fly to center fielder D.J. Davis, who doubled Chavez off at second to end Lansing's 5-0 triumph over the Snappers. Graveman was disappointed after falling just short of the Lugnuts' first no-hitter in 11 years but said his main goal was to stop the team's seven-game losing streak. He did just that, walking one batter, hitting another and tying a career high with seven strikeouts. Graveman (1-0) worked efficiently, forcing 13 groundouts on approximately 92 pitches. "I was throwing the pitches in the zone. Defense played really well behind me, I couldn't have asked for anything better," the Alabama native said. "I was just throwing the sinker, getting a ton of ground balls. The shortstop, Dawel Lugo, made great plays for me all night; I commend him for everything he did." 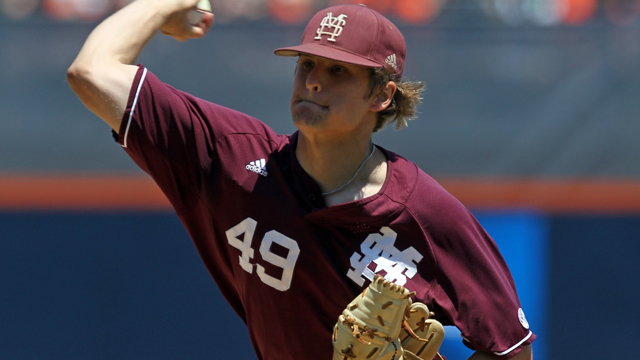 The Mississippi State product has yielded just one run on eight hits over 20 1/3 innings in three starts in his second stint in the Midwest League. Last summer, Graveman went 1-3 with a 4.31 ERA and 35 strikeouts over 39 2/3 innings in 10 starts. Back with the Lugnuts, he's learned the importance of attacking hitters and being aggressive on the mound. "I'm comfortable with the coaching staff, I'm comfortable with the players," he said. "I feel like I'm supposed to be the leader because I have been here, and to lead the younger guys on the staff is one of the most important things I can do. Role model and leader is something I take very seriously." Graveman said earlier in his career he may have lacked the focus to keep a no-hit bid like Friday's intact. But during his brief Minor League tenure, he's learned to rely on routine to get through his starts -- whether he allows one hit or 10. And before that, he developed the skills to thrive on the big state during his career in the Southeastern Conference. At the end of his senior year, Graveman went 1-0 in two starts during the College World Series, helping the Bulldogs reach the finals. "I don't think words can describe playing at TD Ameritrade [Park] with a crowd of 23,000, 24,000," he said. "You're going to be nervous, but to have experiences like that is something you can't teach." Before a considerably smaller gathering in Beloit, the Lugnuts got three hits and two RBIs from first baseman Matt Dean, while Dickie Joe Thon went 2-for-4 with two RBIs and two runs scored. Dylan Covey (0-2) held Lansing to two hits through two innings but ended up allowing five runs on nine hits over 6 2/3 frames. The A's 13th-ranked prospect struck out five without walking a batter.